The Ankarres Guard was named after the lightsaber crystal the Ankarres Sapphire. The Ankarres Sapphire, also known as the Antares crystal, was a crystal that possessed legendary healing powers and numerous other effects. It was one of the most potent crystals that could be used in lightsaber creation. It was also a crystal of great power and could aid a Jedi in battle. The crystal may have been found by the Jedi Exile at some point in 3,951 BBY. It was also held on board Kuari Princess by Dom Pricina until stolen by 4-LOM sometime before the Battle of Yavin. The droid pawned the sapphire on Darlyn Boda, but when it did not sell, 4-LOM brought it back to his partner. He then attempted to use the Ankarres Sapphire to heal Zuckuss and Samoc Farr. The Ankarres are protectors and guardians of the Jedi Temple on Talus. They are also somewhat of a small militia organization. They handle the laws and order of Talus and the laws of the Jedi. The Ankarres will sometimes travel with a Jedi if they need assistance in a mission or investigation, especially if that Jedi is a little inexperienced in combat and the force. The group consists of the General, Captain, and Lieutenant, followed by the Guardians and Initiates. The Guardians will sometimes train initiates in combat so they may be formidable warriors for when they engage in combat. The Law of the Ankarres: They are protectors of peace and the light. If one were to break this peace and light the Ankarres Guard will be forced to deal with the situation. When the Jedi are threatened the Ankarres will be there to assist the situation. As an Ankarres, they do not infringe their beliefs or philosophy on the current Jedi in training, due to the fact it could cause unbalance and possibly conflict of interest. By doing this, as an Ankarres you retire yourself from the force and will be asked to disband from the academy. 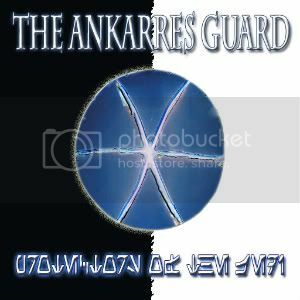 We Are The Ankarres: As the Ankarres Guard we search for the inner peace and light in ourselves and others. One does not need to be a Jedi in order to exist within our forces, but only need to be of good heart and right mind. Our armor is a symbol of our bond with one another, in unity we stand and shall become one. The ankarres will be given the third floor of the academy, with barracks, command center and such. The armor will be displayed in the barracks for newly recruits to purchase, it will be anywhere from 50-100l. This armor will be very detailed and we want to be able to give back linden to the builder who deserves the credit. You do not have to be a jedi to enter the ankarres, you may be a jedi still from a different order and still get in. But when your characters ideals clash with the jedi around you, and your influence spreads on them, your character will more than likely be seen by the grand master. Ankarres do not have any authority on other planets, but on Talus they have the right to arrest and detain those who are on our planet causing pain or trouble. The Ankarres do not take orders from the jedi except from the Grand Master himself. The Ankarres will also be somewhat of the grand master's eyes as he is not around. Hopefully this will bring more active investigation RP's and more relationships between Jedi and non jedi characters.